Recent studies in murine mammary tissue have identified functionally distinct cell populations that may be isolated by surface phenotype or lineage tracing. Previous groups have shown that CD24medCD49fhigh cells enriched for long-lived mammary epithelial cells can be serially transplanted. Flow cytometry-based enrichment of distinct phenotypic populations was assessed for their gene expression profiles and functional proliferative attributes in vitro and in vivo. Here, we show Thy-1 is differentially expressed in the CD24medCD49fhigh population, which allowed us to discern two functionally different populations. The Thy-1+CD24medCD49fhigh phenotype contained the majority of the serially transplantable epithelial cells. The Thy-1−CD24medCD49fhigh phenotype contains a rare progenitor population that is able to form primary mammary outgrowths with significantly decreased serial in vivo transplantation potential. Therefore, Thy-1 expression in the immature cell compartment is a useful tool to study the functional heterogeneity that drives mammary gland development and has implications for disease etiology. Mammary development is a highly ordered process that is regulated by spatiotemporal cues and directed by local and systemic signals . Seminal studies in murine mammary cell biology revealed that the CD24medCD49fhighCD29high cell surface phenotype enriches for mammary repopulating units (MRUs) that have the greatest in vivo proliferative capacity, as measured by serial in vivo transplantation and differentiation into specialized cell types [2, 3]. However, the functional heterogeneity of phenotypically enriched pooled-cell populations complicates descriptions of such populations . Therefore, there remains a need for better phenotypic markers to prospectively enrich for different functional cell populations that can be used to characterize these populations transcriptionally or precisely mark certain populations using lineage-tracing strategies. Thy-1, or CD90, is a GPI-anchored cell surface protein that was originally described as a mouse brain and thymus marker. Subsequent studies have shown that the Thy-1 antigen is expressed on many cell types, including hematopoietic stem cells (partially reviewed in [5, 6]). Thy-1 is expressed by basal cells in normal human mammary epithelium , where stem cells are thought to reside. Using the Thy-1+CD24+ phenotype, our group prospectively enriched for tumorigenic cells from a subset of MMTV-Wnt1 murine mammary tumors that share properties with normal murine MRUs (mammary repopulating units, also known as stem cells) [8, 9]. Therefore, we sought to improve upon the current murine MRU cell surface phenotype by functionally assessing the prospective enrichment of serially transplantable mammary cells using Thy-1 expression. Our data revealed that Thy-1 expression on immature cells enriches for serially transplantable MRUs. Interestingly, the immature cells that lack Thy-1 expression enriched for a previously unknown rare population, which we term short-term mammary repopulating units (ST-MRUs), with limited serial proliferative potential in vivo. C57BL/6 and FVB mice were purchased from The Jackson Laboratory, Bar Harbor, ME, USA. pCx-GFP founder mice were kindly provided by Dr. Irving Weissman. All animals were maintained at the Stanford Animal Facility in accordance with the guidelines of both Institutional Animal Care Use Committees. Six- to 10-week-old mice were euthanized and all fat pads surgically resected. Tissue was digested in Media 199 + 10 mM HEPES + PSA or L-15 for 2 h, and single-cell suspension was obtained as described previously  and then processed as described by the manufacturer’s instructions for Epicult (Stemcell Technologies, Vancouver, BC, Canada). For all experiments, cells were > 99% viable as assessed by Trypan Blue dye exclusion. Cells were then resuspended at a concentration of 1 × 107 per ml and subjected to staining for flow cytometry. The antibodies CD24-PE, Thy-1.1-APC, Thy-1.1-PE-CY7, Thy-1.2-APC, and Thy-1.2-PE-CY7 were obtained from eBioscience (San Diego, CA, USA), CD45-BIO, Ter119-BIO, CD31-BIO, and CD140α-BIO were obtained from BD Pharmingen (San Jose, CA, USA), and Streptavidin-Pacific Blue was obtained from Invitrogen (Carlsbad, CA, USA). FACS for all experiments was performed on BD FACSAria II equipped with a UV laser. All gating to distinguish positive and negative expression was based upon IgG-isotype color-specific control staining. Ultra-low attachment 96-well plates (BD, Franklin Lakes, NJ, USA) were prepared with a feeder layer of irradiated L1-WNT3a mixed with 60 μl of growth factor-reduced Matrigel (BD) per well. Sorted cells were then plated into liquid media as previously described [10, 11] 10% FBS, 250 ng/ml Rspo I (R&D Systems, Minneapolis, MN, USA) and 2.5% growth factor-reduced Matrigel were added as supplements. 5 ng/ml purified mouse TGFβ1 ligand (R&D Systems) was added to wells as indicated. Colonies were counted after 7 days in culture in a 5% CO2 incubator. Sorted cell populations were collected in HBSS + 2% HICS and resuspended at the correct concentration before being injected into the cleared fat pads of 21–28-day-old recipient C57Bl/6 mice as previously described . For all injections of 600 cells and below, cell counts were verified using either a nuclear staining count (1% Trypan Blue/0.1% Triton-X 100 in PBS) or GFP+ cell count. Cells were injected in either 10 or 5 ul volumes of PBS using a 25 ul Hamilton syringe. All transplants were allowed to grow for at least 5 weeks, but not more than 10 weeks before analysis. In the case of secondary and tertiary transplants, whole glands were dissected under fluorescence to obtain 1–2 mm pieces of tissue that contained GFP+ ductal structures that were transplanted into recipient mice. Whole mounts stained with carmine alum were processed according to a standard protocol . For immunocytochemistry, mammary glands were fixed in formalin and embedded in paraffin. Three-micrometer sections were dewaxed, hydrated and microwaved for 20 min in Tris-EDTA (0.01 M; pH 9) for antigen retrieval. Tissue sections were incubated overnight at 4 °C with primary antibodies in TBS + 1% BSA. Antibodies were CK6 (Covance, Princeton, NJ, USA), CK5 (Covance), Troma-I (DSHB, Iowa City, IA, USA) and Troma-III (DSHB). Sections were then incubated with anti-rat–Alexa A488 antibody and anti-rabbit–A594 antibody (both from Invitrogen) for 30 min at room temperature. Secondary antibodies were applied at 1:200 dilution. Samples were stained with DAPI and mounted in ProLong before pictures were taken. All images were produced with a Leica (Wetzlar, Germany) microscope and Image Pro Software (Media Cybernetics, Rockville MD, USA). Sorted cell populations were collected in staining media directly and then centrifuged at 5000 rpm for 5 min at 4 °C. Supernatant was then carefully removed from the cell pellet, which was immediately frozen in liquid N2 and stored at −80 °C until RNA extraction. RNA was extracted from frozen cell pellets by the Trizol method or MirVana kit (Life Technologies, Carlsbad, CA, USA). For RT-PCR, RNA was then converted to cDNA using the Superscript III Reverse Transcriptase system (Invitrogen). qPCR was then performed on fresh cDNA with 2 × SYBR Green Master Mix (Applied Biosystems, Foster City, CA, USA) according to the manufacturer’s instructions with primers to amplify specific genes (available upon request). RNA was then processed for microarray hybridization by the Stanford Protein and Nucleic Acids core facility. RNA was applied to Affymetrix (Santa Clara, CA, USA) GeneChip Mouse Genome 430 2.0 oligonucleotide arrays. The resulting CEL images were then processed using the TIGR TM4 [13, 14] suite of bioinformatic software. Arrays were pre-processed by MIDAS using robust multichip average (RMA) normalization across all samples. Using Cluster 3.0 , probes that expressed less than 6.229 (in Log2 space) in any two of the arrays and whose value was not at least fourfold different in any two arrays were excluded from the analyses. Probes intensities were then mean centered across all arrays as a set. Using MeV (TIGR), Rank products algorithm was then used to compare different populations using two-class unpaired comparisons with a critical p value of 0.01 for differentially expressed probes. Heatmaps are scaled from −3.0 (low) to 3.0 (high) in Log2 space. Microarray data may be found at GenBank under accession GSE89720. Previous studies have shown CD49f and CD24 are cell surface markers that are able to distinguish self-renewing MRUs (CD24medCD49fhigh) from basal myoepithelial cells (CD24lowCD49fmed), CD24highCD49fmed colony-forming cells, and CD24medCD49f−/low luminal cells [2, 3]. We found that Thy-1 was expressed on ~30% of luminal cell populations and ~50% of CD24medCD49fhigh and myoepithelial cells (Fig. 1a, b, c, d). We also found that Thy-1 was expressed by CD24med/highCD133+Sca-1+ hormone-sensing luminal progenitor cells  as well as CD61+ luminal progenitor cells  (Additional file 1: Figure S1A). Real-time PCR confirmed the basal or luminal identity of sorted populations based on the expression of Smaα and Krt14 (basal marker) and Krt18 and Krt19 (luminal marker) genes, respectively (Fig. 1e and f). To test if our enrichment procedures dramatically altered the physiology of the sorted populations, we exposed sorted populations to TGFβ1, a well-studied ligand that is associated with epithelial-to-mesenchymal transition . Sorted populations that expressed basal or luminal gene markers shared similar responses to TGFβ1 exposure (Additional file 1: Figure S1B). Therefore, the sorting paradigm and related procedures effectively enriched for physiologically distinct phenotypic populations. Numerous studies have linked the transcriptional expression of key genes to the function of cells enriched for by cell surface demarcation or lineage-tracing strategies [16, 19]. For example, Tbx3 is a gene that regulates the development of mammary hormone-sensing cells . Interestingly, we found that all populations except for the Thy-1 expressing CD24medCD49fhigh cells also expressed Tbx3 (Fig. 1g). This population also had a low transcriptional level of Cdkn1a (Fig. 1h), whose expression is associated with halted cell cycle progression, comparable to luminal CD24highCD49fmed cells that have been previously characterized to be highly proliferative. Furthermore, single-cell RNA-Seq data from the Marioni and Khaled laboratories showed that Thy-1 is most highly expressed in cells that are enriched for Procr, a Wnt target gene that has been linked to multipotent mammary stem cells  (Fig. 1i). Taken together, these results suggested that Thy-1 does indeed segregate a functionally distinct subpopulation of CD24medCD49fhigh cells. To further investigate the transcriptional differences that define each population, we performed gene expression microarrays on sorted cell populations. We found that Thy-1+CD24medCD49fhigh, Thy-1−CD24medCD49fhigh, and CD24lowCD49fmed cells had unique global gene expression profiles in both C57BL6 and FVB mice (Fig. 2a, b, Additional file 2: Figure S2A and B). There were both strain-specific and distinct genes expressed by sorted populations (Additional file 3). Notably, the Thy-1+CD24medCD49fhigh cells expressed the highest level of genes that have previously been linked to mammary gland stem cells such as Rarres2 and Aldh1a1 [22, 23] (Fig. 2a). The enriched expression of Rarres1 and Aldh1a1 in both mouse strains’ microarray data in the Thy-1+CD24medCD49fhigh cells was confirmed by real-time PCR and in Procr-enriched cells by single-cell RNA-seq from the Marioni and Khaled laboratories  (Additional file 1: Figure S1C, D, E, F). The Thy-1+CD24medCD49fhigh population was also enriched for the expression of Procr by real-time PCR (Additional file 1: Figure S1E), with the Procr-enriched population expressing high levels of both Procr and Thy-1 by single-cell RNA-seq (Fig. 1i and Additional file 1: Figure S1H). We also observed that CD24highCD49fmed luminal cells expressed genes that distinguished this population from CD24medCD49f−/low luminal cells in both the C57BL6 and FVB mouse strains (data not shown, Additional file 2: Figure S2C and Additional file 3). In the BL6 strain, the CD24medCD49f−/low population was enriched for the expression of Elf5, a transcription factor that suppresses mammary stem cell activity  (Additional file 3). Murine mammary stroma depleted of endogenous epithelium provides an excellent in vivo model system to assess the repopulating potential and frequency of implanted cell populations. We leveraged this system and transplanted sorted cell populations from pCx-GFP transgenic mouse cells that ubiquitously express GFP to distinguish donor outgrowths from any residual endogenous epithelium. We found that 100 Thy-1+CD24medCD49fhigh and 100 Thy-1−CD24medCD49fhigh cells were able to produce GFP+ ductal outgrowths that looked morphologically similar to those produced by 100 bulk mammary epithelial cells (MECs) (Fig. 3a). However, neither luminal CD24highCD49fmed progenitor cells, CD24medCD49f−/low luminal cells, nor CD49fmedCD24low differentiated myoepithelial cells were able to produce extensive outgrowths up to 10,000 cells transplanted (Fig. 3a and data not shown). Limiting dilution transplantation studies revealed that the frequency of engrafting cells in the total CD24medCD49fhigh population was 1 in 254 cells, consistent with previous reports (Fig. 3b, c, Additional file 4: Figure S3A). Strikingly, we observed that the majority of the outgrowth-forming ability was confined to CD24medCD49fhigh cells that also expressed Thy-1 (Fig. 3b, c, Additional file 4: Figure S3A). Single-cell transplantation revealed that one in eight cells from the Thy-1+CD24medCD49fhigh population were able to produce clonal outgrowths (Fig. 3d). Previous reports using limiting dilution transplantation studies revealed that the MRU frequency within the CD24medCD49fhigh phenotype might be influenced by the strain of mice employed [2, 3]. Therefore, we performed another set of limiting dilution transplantation experiments in wild-type (WT) FVB mice (Additional file 4: Figure S3B). Again, we found that CD24medCD49fhigh cells that also expressed Thy-1 contained most of the outgrowth-forming cells (Additional file 4: Figure S3C). In FVB mice, the Thy-1−CD24medCD49fhigh cells gave rise to smaller ductal outgrowths that were largely devoid of side branching structures (Additional file 4: Figure S3D). The frequency of outgrowth-forming cells in the Thy-1+CD24medCD49fhigh population was 1 in 156 cells in FVB mice, similar to the frequency in C57BL6 mice (Additional file 4: Figure S3E). MRUs are defined as cells that have both the ability to self-renew and to differentiate into mature luminal and basal cells that give rise to functional milk-secreting epithelium. The presence of MRUs can be detected by serially passaging transplanted cells or tissue fragments in vivo since only cells with extensive proliferative capacity will be able to continually produce outgrowths [3, 26]. Our initial transplantation data showed that the Thy-1+CD24medCD49fhigh phenotype contained most of the outgrowth-forming cells. We serially transplanted 2 mm3 fragments of GFP+ donor epithelium from the initial primary outgrowths that were produced by C57BL6 Thy-1+CD24medCD49fhigh, or Thy-1−CD24medCD49fhigh GFP+ cells and found these outgrowths grew secondary GFP+ structures (Fig. 4a). A total of 23 out of 33 Thy-1+CD24medCD49fhigh primary GFP+ epithelial fragments engrafted upon secondary transplantation, giving an engraftment efficiency of about 67% (Additional file 5: Figure S4A). We found that Thy-1+CD24medCD49fhigh cells were able to give rise to secondary ductal outgrowths that resembled the outgrowths formed from bulk MECs and the phenotypic CD24, CD49f and Thy-1 diversity of WT glands (Figs. 1 and 4c). Thy-1+CD24medCD49fhigh primary outgrowths were also able to give rise to tertiary outgrowths similar to bulk MECs (Additional file 5: Figure S4B). 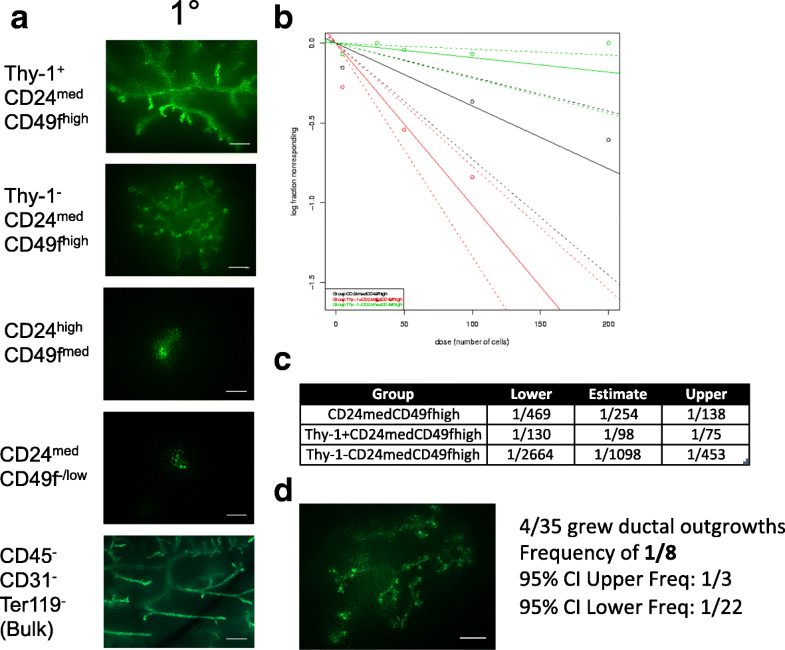 Strikingly, we found that only 11% of the GFP+ fragments produced by Thy-1−CD24medCD49fhigh transplanted cells were able to form secondary outgrowths (Additional file 5: Figure S4A). In addition, the secondary outgrowths were much smaller than those produced by initially engrafted GFP+ Thy-1+CD24medCD49fhi cells (Fig. 4a). Unlike the Thy-1+CD24medCD49fhigh epithelium that produced tertiary outgrowths like bulk MECs, the few GFP+ secondary outgrowths formed by the initially engrafted GFP+Thy-1−CD24medCD49fhi cells were unable to re-engraft a third time (Fig. 4a). These data demonstrated that Thy-1+CD24medCD49fhigh phenotype enriched for MRUs and that the Thy-1−CD24medCD49fhi phenotype cells were enriched for basal short-term MRUs (ST-MRUs) with less proliferative capacity. Functionally competent mammary epithelium will be able to give rise to alveolar milk-secreting cells upon pregnancy. We took mice that were engrafted with secondary GFP+ outgrowths produced by bulk MECs and Thy-1+CD24medCD49fhigh cells at 10 weeks posttransplantation and mated them to determine the milk-producing capability outgrowths. Hematoxylin and eosin staining showed extensive expansion of the ductal epithelium (Additional file 5: Figure S4C). Cytokeratin staining showed CK14, CK8, CK19, and CK6 localization was indistinguishable between WT (non-transplanted), primary, and secondary GFP+ transplanted epithelium produced by Thy-1+CD24medCD49fhigh cells (Additional file 5: Figure S4C). In addition, Thy-1+CD24medCD49fhigh secondary outgrowths underwent pregnancy morphogenesis in a similar fashion to WT epithelium as evaluated by cytokeratin expression, with visual confirmation of milk inside of the lumen of ducts in hematoxylin and eosin staining (Fig. 4c). Prospective isolation studies have shown that mammary tissue contains a distinct cell population of MRUs that is enriched for the ability to establish a functionally competent mammary gland in serial transplantation assays [2, 3]. We found that the Thy-1+CD24medCD49fhigh phenotype enriches for mammary cells with the highest proliferative capacity as measured by this assay. Surprisingly, we found single-cell transplantation revealed a highly enriched MRU frequency in the Thy-1+CD24medCD49fhigh cells compared to pooled-cell transplants, which may be due to multiple progenitor cells competing for sparse niche components. We also noted that the Thy-1+CD24medCD49fhigh cells expressed genes associated with these cells with extensive proliferation capacity . Since the Thy-1−CD24medCD49fhigh population contains cells with diminished capacity to serially form extensive ductal outgrowths in vivo, these cells may be comparable to multipotent progenitor cells in the hematopoietic system, which also have a lesser proliferative capacity compared to stem cells. To our knowledge, this is the first report of the existence of a mammary epithelial cell population with short-term MRU capacity. In addition to MRUs, unipotent progenitor cells have been identified and bipotent progenitor cells that lack in vivo transplantation capacity have been previously described [2, 27]. We found that the ortholog of TBX3, a gene mutated in ulnar mammary syndrome (UMS), was expressed in all populations except for Thy-1+CD24medCD49fhigh. Recent studies have shown that Tbx3 is required for the mammary development and generation of hormone-sensing cells in murine mammary epithelium [28, 29]. Our data suggests that the UMS breast phenotype may be a defect of aberrant specification of cells with the capacity to undergo terminal differentiation. Recent studies have also demonstrated that Elf5 expression is necessary for the differentiation of luminal progenitor cells . Our data showing that the CD24medCD49f−/low compartment expresses Elf5 suggests that this compartment participates in a feedback pathway that instructs mammary epithelial cells to proliferate and differentiate. Taken together, our data shows that the inclusion of Thy-1 expression to the growing list of phenotypic markers will allow further dissection of the mammary cellular hierarchy and allow for more accurate interpretation of pooled or single-cell analyses. Neethan Amit Lobo and Maider Zabala contributed equally to this work. We thank Jesse Engreitz and Maximillian Diehn for their bioinformatic advice. NIH/NCI grant 5P01 CA139490–05, NIH/NCI grant 5U01CA154209–04, NIH/NCI 5R01 CA100225–09, Department of Defense grant W81XWH-11-1-0287, Department of Defense/Breast Cancer Research Program (BCRP) Innovator Award W81XWH-13-1-0281, the Breast Cancer Research Foundation, the Ludwig Foundation, and the Breast Cancer Research Program Predoctoral Award DAMD17–03–1-0340. The datasets used and/or analyzed during the current study are available from the corresponding author on reasonable request. Microarray data are publicly available at the National Center for Biotechnology Information Gene Expression Omnibus dataset GSE89720. NAL contributed to conception and design, collection and/or assembly of data, data analysis and interpretation, manuscript writing, and final approval of manuscript. MZ contributed to conception and design, collection and/or assembly of data, and data analysis and interpretation. DQ contributed to collection and/or assembly of data. MFC contributed to conception and design, financial support, administrative support, provision of study material or patients, data analysis and interpretation, and final approval of manuscript. All authors read and approved the final manuscript. All animal studies were performed in accordance with protocols reviewed and approved by the Stanford University Institutional Animal Care and Use Committee, in AAALAC-approved animal care facilities. Plante I, Stewart MK, Laird DW. Evaluation of Mammary Gland Development and Function in Mouse Models. J Vis Exp. 2011;53:e2828. https://doi.org/10.3791/2828.